A levain leavened rustic roll. Crusty, light, assertive sour flavor. 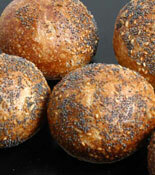 Coated with fennel, poppy & sesame seeds.